The recommendation of dental professionals is to replace your toothbrush, or in the case of an electric toothbrush, your brush head, every 3 months. As we brush, the bristles become worn. 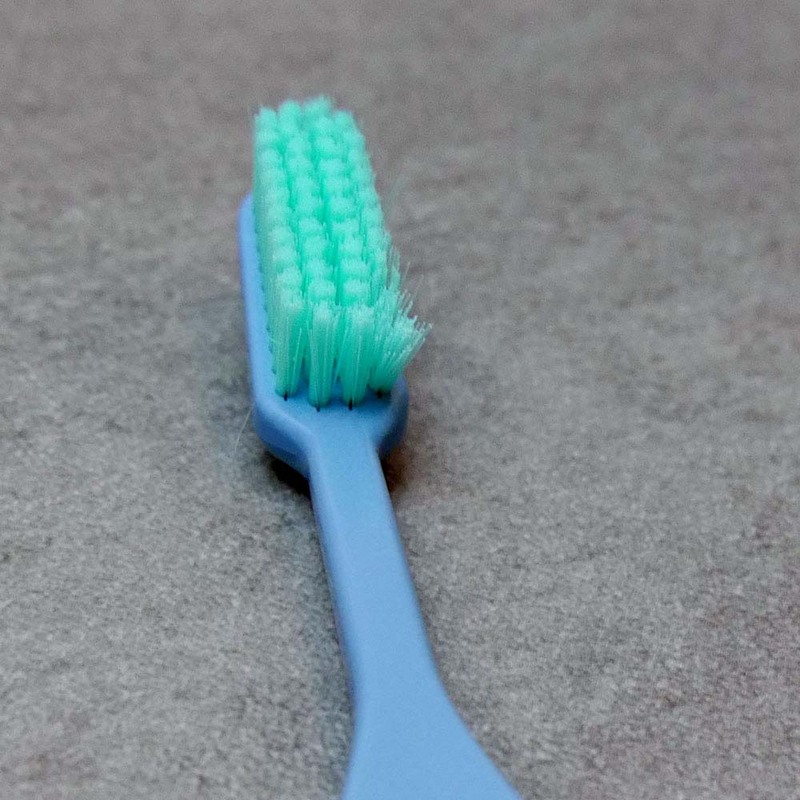 The bristles can deform and become less effective in their cleaning. Ultimately, left unchanged they can do more damage than good. There is lots of choice, there appear to be hundreds of manual toothbrushes to choose from and nearly as many different brush heads for electric toothbrushes. The last thing anyone needs is yet another brand to choose from right?! TIO are a new company, but they offer something quite different, a unique selling point (USP) that really does make them stand out from the crowd of all the other choices available today. TIO is a German company, setup by Fabian Ghoshal and Benjamin Beck. They want to show the world that pollution is not a necessity and that a sustainable redesign of a toothbrush, in their words, ‘can be a beautiful thing’. It is their belief that sustainable products can make a huge difference, saving tons of waste and being better for our planet. Starting as a Kickstarter campaign, the successful funding has allowed Ben and Fabian to make TIO into what it is today. The fundamental difference and what makes TIO products unique is what they are made from. The TIO manual toothbrush as well as their electric toothbrush heads are made from sustainable materials, primarily bioplastics. In comparison, the majority of toothbrushes we use today are made from nonrenewable (oil derived) compounds. Essentially speaking, using a bioplastic based toothbrush is better for our planet, particularly when you consider the scale at which toothbrushes are produced, used and disposed of. Sustainability built into each product is the USP for TIO. something few other companies can claim at this time. 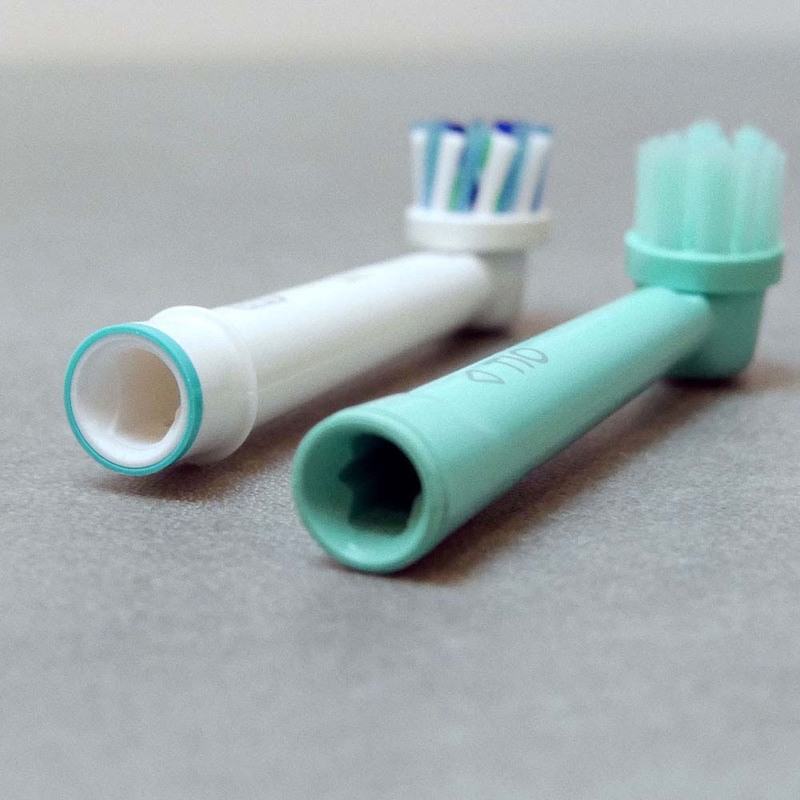 TIO produce a manual toothbrush, with replaceable brush heads as well as replacement brush heads for Oral-B electric toothbrushes, both of which are made from bioplastics. This hands-on review actually looks at both products. Please note: In between buying, testing and writing this review, Tio have taken these Oral-B brush heads off sale. As I understand it, they are currently being ‘improved’. What improvements are being made, I am not sure. However, I suspect a couple of the issues addressed in this review might form part of this improvement process. Therefore please be aware that the review below is based on my experience of the heads, prior to being removed from sale for improvement. When it comes to replacing the brush head on your Oral-B electric toothbrush, naturally Oral-B recommend using only their own original heads, but you have the choice of whether you do or not. 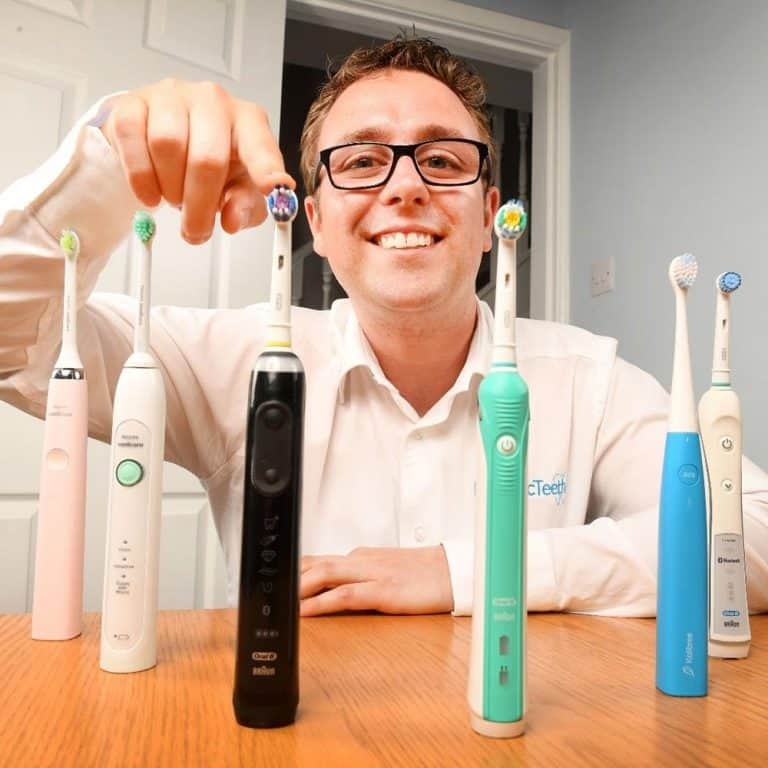 TIO’s brush heads are an after-market, compatible with solution to the Oral-B originals that you can buy. To give them their official product name ‘TIOMATIK’ Oral-B compatible brush heads are designed to clean the teeth and perform in a similar way to the original brush heads, but they are not made or designed in such a way that they are exact replicas or fakes of the originals. What makes TIO brush heads a desirable option, is the bioplastic construction and the benefits this brings for the planet, more on that a little later. What do you get with TIOMATIK? 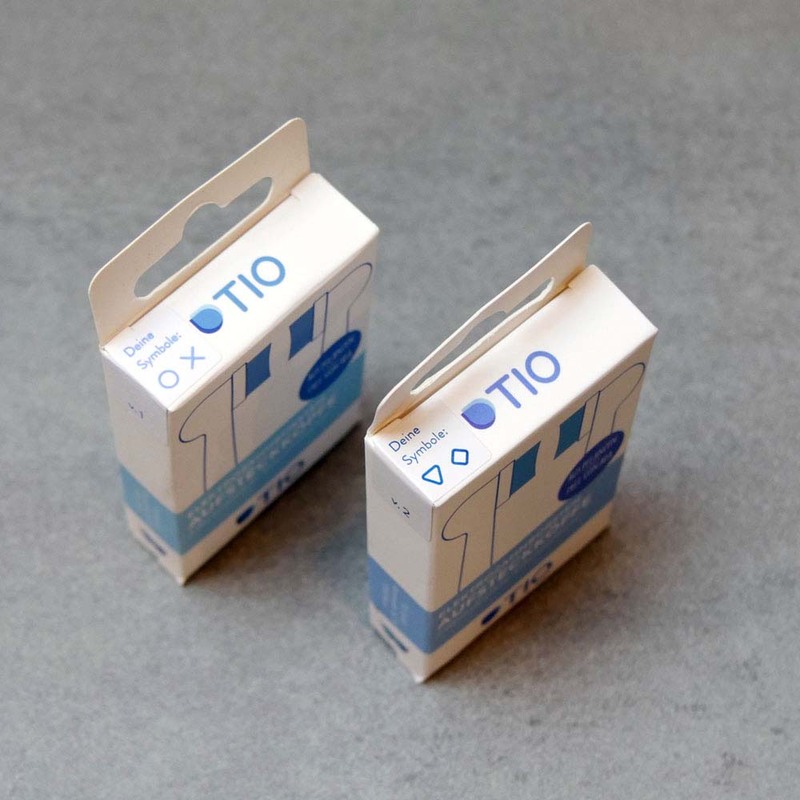 TIO’s TIOMATIK Oral-B compatible brush heads come in packs of 2. You get 2 brush heads in each pack only, nothing else. When purchasing TIOMATIK, you have 2 options to choose from. This choice has no functional impact on the brush head, but is purely a choice of the symbol printed on the neck of the brush head. The idea is that the symbol is used as a way to differentiate between whose brush head is whose. It is an alternative to the Oral-B coloured rings. If you ordered a pack of Cross & Circle, 1 brush head in the box would have a Cross on the brush head whilst the other would have a Circle. When ordering brush heads for a family of 4 people for example, you would want to order a pack of each. This would mean you would end up with 4 brush heads, each with a different symbol on it, therefore making it clear who used what brush head. If you ordered 2 packs of Cross & Circle, it would not be easy to differentiate which of the heads were being used by each user. What is the price of TIOMATIK? At the time of review a pack of 2 brush heads will cost €7.90. which is approximately £7. Euro’s € is the standard currency in Germany and whilst most payment providers will convert € to £ as the transaction takes place, the list price is not advertised in £, so there is always some potential change in price because of exchange rates. It should be noted there may well be a shipping cost to factor in too, subject to the total amount you spend with TIO. Whilst it is not about a direct comparison necessarily with Oral-B’s own the TIMOATIK brush heads are a touch more expensive, with the average Oral-B head being priced at around £3 each. A premium is to be expected to some extent, not only because of the innovative use of bioplastics, but because TIO just don’t have the scale to be able to produce as cost effectively as Oral-B. How well do they clean? Now, let me be clear, this review is not a clinical test or study into how well the brush head actually cleans the teeth and gums in comparison to the Oral-B originals. I am testing these brush heads as a user, just like you. 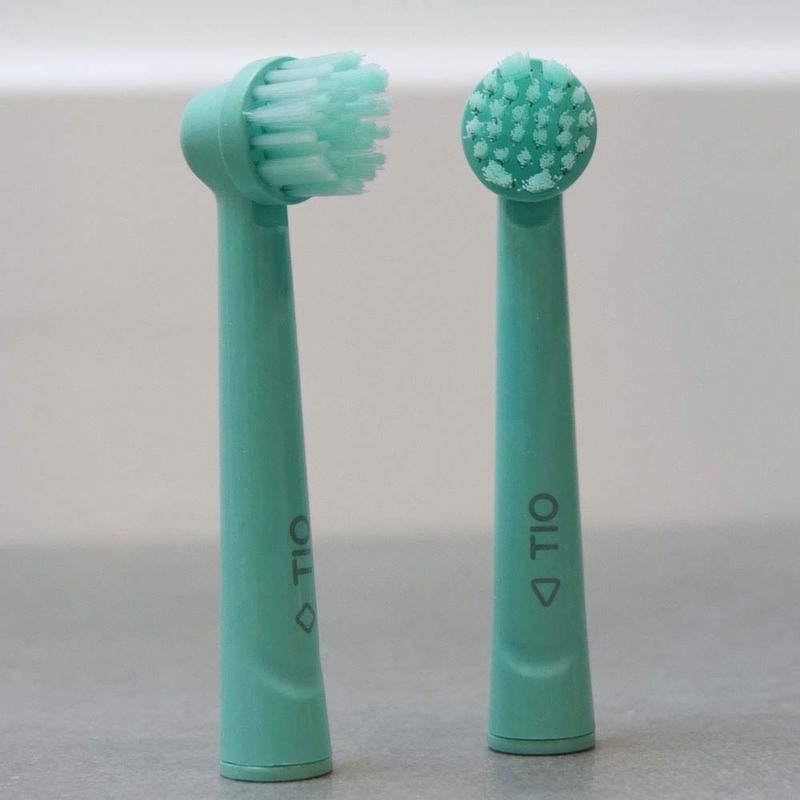 My own hands on testing and use left me with no concerns over the cleaning performance, but I cannot strictly say whether the cleaning action of the TIO brush head is better or worse than the Oral-B originals. Tio actually produced the brush heads in conjunction with Dr Stefan Zimmer a leading dental specialist at the the University of Witten/Herdecke, so theoretically it should be very good. I would suggest it was on par with Oral-B’s own heads and any inferior cleaning performance would be very difficult to actually determine and would even over a long term test have little impact on your overall oral health. Had I been brushing my teeth with a blindfold on, I could not have easily told you whether it was an Oral-B or TIO brush head. When compared to a manual brush, you are getting the majority of the benefit through the increased number of movements the electric toothbrush head brings. Of course the feeling of how well they clean is subjective and your opinion may well be different. In fact, my colleague tried these and felt that they were bulkier and more awkward to clean with than the originals. Just shows how everyone has different opinions. Unlike most brush heads, the bristles used on the TIMOATIK are made from castor oil rather than nylon. A relatively new technology, little information exists to really compare them to nylon in how well they perform, but they are a more sustainable option and appear to be as good and will likely only improve further as technology and research advances. 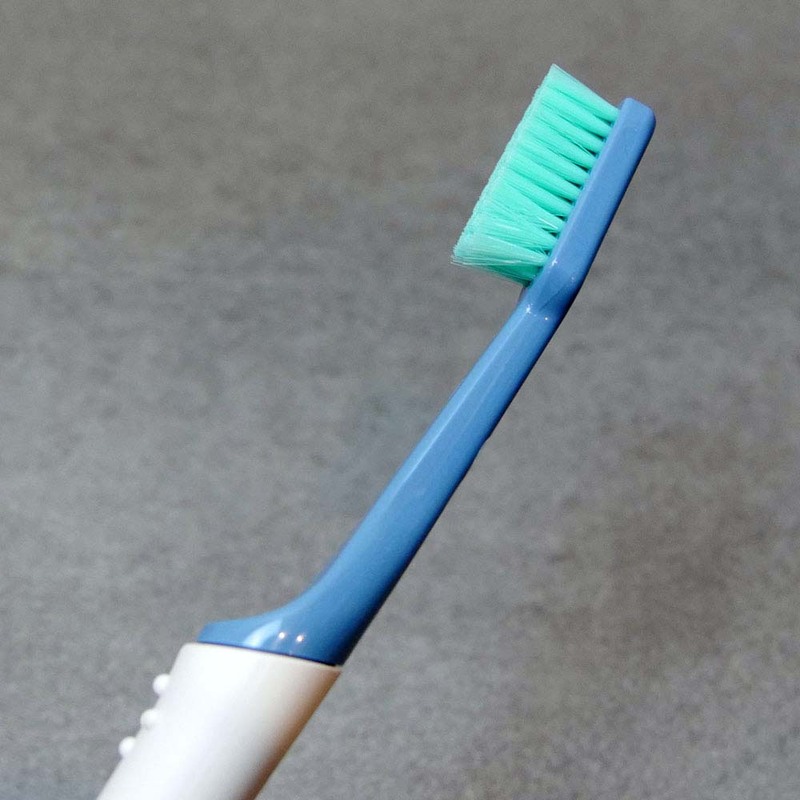 The brush head is small and round like Oral-B and the tips or the bristles are rounded too, rather than being roughly cut, this means they are less likely to damage the teeth and gums. Not quite as soft as Oral-B’s sensitive brush head, the bristles on the TIOMATIK brush heads are a little firmer in my opinion, but far from the stiffest bristles I have used and offered a pleasant cleaning experience. Oral-B brush heads have fading indicator bristles that act as a reminder to change your brush heads, TIMOATIK do not, it is up to you to remember. An ever present question and thought I have, is how much benefit the shape and positioning of the bristles have. The TIOMATIK brush heads are available in just 1 style, there is no choice in the shape, cut and positioning of the brush bristles. Oral-B have some more uniquely shaped brush heads with differently spaced and sized clusters of bristles that come with varying lengths that are supposed to clean more effectively. Whilst there indeed might well be some benefits and reasonable claims as to why each style is better, I have yet to come across any really compelling evidence that confirms they make significant differences in the results. Therefore, for most people, don’t worry too much about how the bristle configuration is different. That said, if you do have particularly sensitive teeth and gums, I would stick with the Oral-B original Sensitive brush head. Daily Use – How do they compare to the originals? It is difficult not to compare TIO’s Oral-B compatible brush heads with those originals produced by Oral-B, but it is not all about a direct comparison in my opinion. 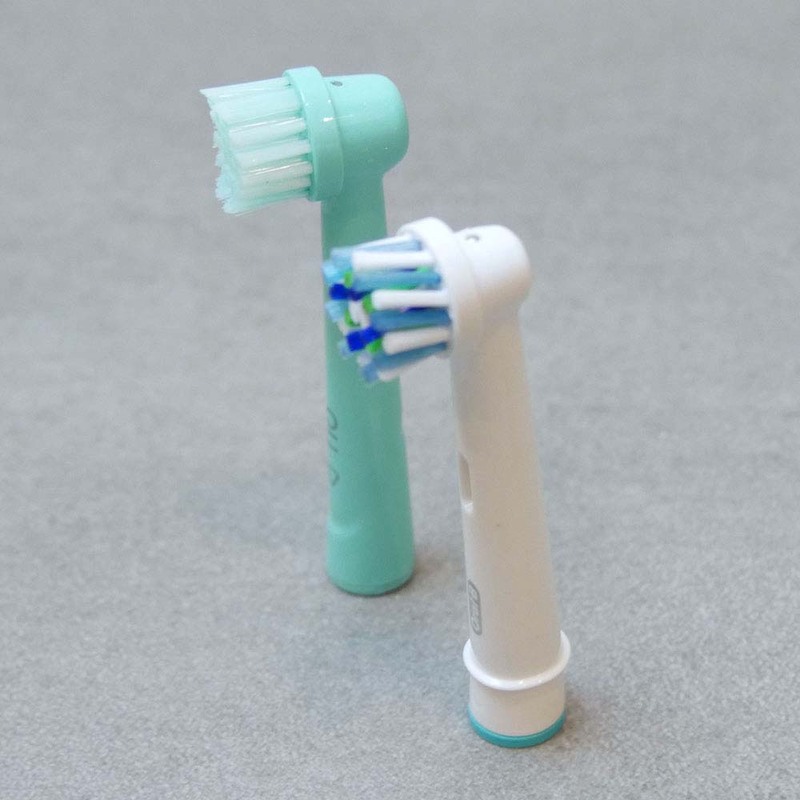 Fundamentally, the big difference here is that the TIMOATIK brush heads are more considerate of the world as a whole given that they are made using sustainable products and are not as reliant upon the non-renewable elements that make up the plastic that is so important with those made by Oral-B. I will make further comment on this in the bioplastic section of this review. From a day to day use perspective there is not a great deal to tell them apart and as I mentioned in previously I would be hard pressed to actually tell them apart in a blindfold test. TIO’s brush heads are a turquoise/green colour and this is completely intentional according to the company. This is to make them stand out and they actually felt the colour worked quite well with the primarily white brush handles that Oral-B offer. I think it would be nice to have a white colour option, particularly as the green colour does not work quite so well with my black coloured Genius 9000 toothbrush, but it is not a deal breaker. The TIMOATIK heads fit on all Oral-B brush handles and simply push on and pull off, like the originals. Whilst initially the fit and connection to the brush handle was good, there is a problem, certainly with the heads I tested. I found that after about a week, the brush head actually came disconnected from the brush handle far too easily. What I mean by this, is that original brush heads, and most aftermarket heads will fit snugly to the brush handle and need a small amount of pressure to fit and remove them. If you were to hold the brush by the head and let it dangle, the 2 pieces would remain as 1, unless you physically pull them apart. With the TIMOATIK after only a short period of use, the head came away from the brush handle all too easily and in the test mentioned above, would detach straight away. No pressure or force was needed to detach the brush head. In fact, I actually had the head come off as I brushed my teeth on 2 occasions. I tried replacement head and the exact thing happened. I took a close up look and could see no real reason as to why this was happening. I can only surmise that the plastic is heating up or changing shape ever so slightly during use and it is just enough that it causes the fit to not be as good and ultimately have the head disconnect. This is concerning and essentially stops me wanting to use them all together. It could be a batch issue and perhaps can be fixed by TIO, so I don’t wish to draw too much attention to it, but it is something I experienced. Now to counter this, site co-founder Chris also tried these heads but actually found them to be quite stiff to put onto the Oral-B brush handle. So, it seems like the production tolerances might be a bit out causing this discrepancy. On the whole yes, they are safe. However, as explained in the section above, the fact that the heads I tried came loose is a cause for concern. I was not injured or no actual damage occurred, but potentially someone could cut the soft mouth themselves if they are not paying attention. In the first week where they remain nice and tightly fitted, I had no cause for concern and everything was fine. The original TIO product, this manual toothbrush is designed to be an alternative for those who opt for manual over electric. However, unlike most manual brushes that you just dispose of after 3 months, with TIO, you replace the brush head only. A bit like you do with an electric toothbrush, the TIO manual brush has a detachable head. This means every 3 months you replace the head only and not the handle. Whilst TIO is made from more sustainable materials, this means every time the head is replaced, less waste is being created, because usually the brush handle would be thrown away too. It is a simple and clever concept that I like very much. What do you get with TIO? When you buy a TIO toothbrush you get a brush handle, a brush head and a travel case/cover for the head. When buying, you do have the choice of the colour of the brush head and the stiffness of the bristles. You can choose between soft and medium bristles. I went for soft. The 4 colour choices refer to the head only and not the brush handle, the options are, Lagoon, Glacier, Pebble and Coral. What is the price of TIO? 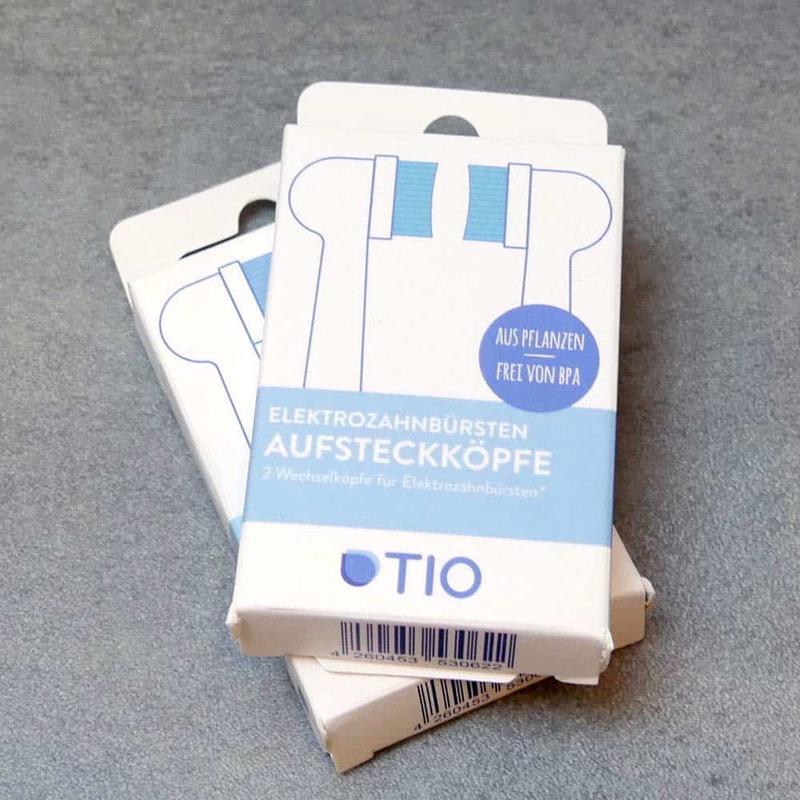 At the time of review a TIO toothbrush is €4.90 which is approximately £4.30. You can pick up manual toothbrushes from about £1 but a fairly good quality toothbrush would set you back around £3 or so, therefore at £4.30 this is a little more expensive. But, you do get a cover for the brush head that you would not normally get with a manual toothbrush. When it comes to replacing the brush heads it gets a bit cheaper, because a pack of 2 replacement heads costs €7.50 which is approximately £6.60 or £3.30 per head. Therefore ongoing, the cost of replacing the head only is about the same price as replacing your manual toothbrush. Whilst cheaper is often preferred, it is not totally unjustifiable to pay a premium for the benefits this brush brings and to support a small company trying to make a difference rather than the larger big brands we all know. I have been very pleased with the overall cleaning experience with this brush and certainly have no cause for concern. This is not a scientific test or research into how well the brush cleans, I am using at home as part of my daily routine like you would. My comment and opinion is my own and is not a matter of fact that it does or does not clean better than any other brush. As I mentioned in my review of the electric toothbrush heads, manufacturers make brush heads in all shapes and sizes with different bristle configurations. I opted for the soft bristled head and it is indeed very soft and gentle on the gums. The head here on TIO is the stereotypical toothbrush head, with a rectangular shape and all of the bristles cut to the same length, although I do believe opting for the medium stiffness would offer different length bristles. There are often suggestions, a wavy bristle pattern or formation can be beneficial to cup the tooth and sweep along the gumline, but I have found the results with the sensitive head to be perfectly adequate here. Even when using plaque disclosing tablets, I found no cause for concern in the brush head missing parts of the tooth surface. Although you would struggle to see it, unless under a microscope, the bristles are rounded at the very tip to ensure that they are gentle on the tooth surfaces and the gums. There isn’t a great deal I can say on the daily use of this toothbrush. The handle is rounded at the top and tapers to a slimmer profile at the lower end of the handle, making it a bit thinner at the bottom than most manual brushes. Whilst the bioplastic handle is smooth to the touch, there are 4 raised dots, just below where the brush head joins that gives a bit of grip. The length of the handle is good and I could easily reach to the back teeth. 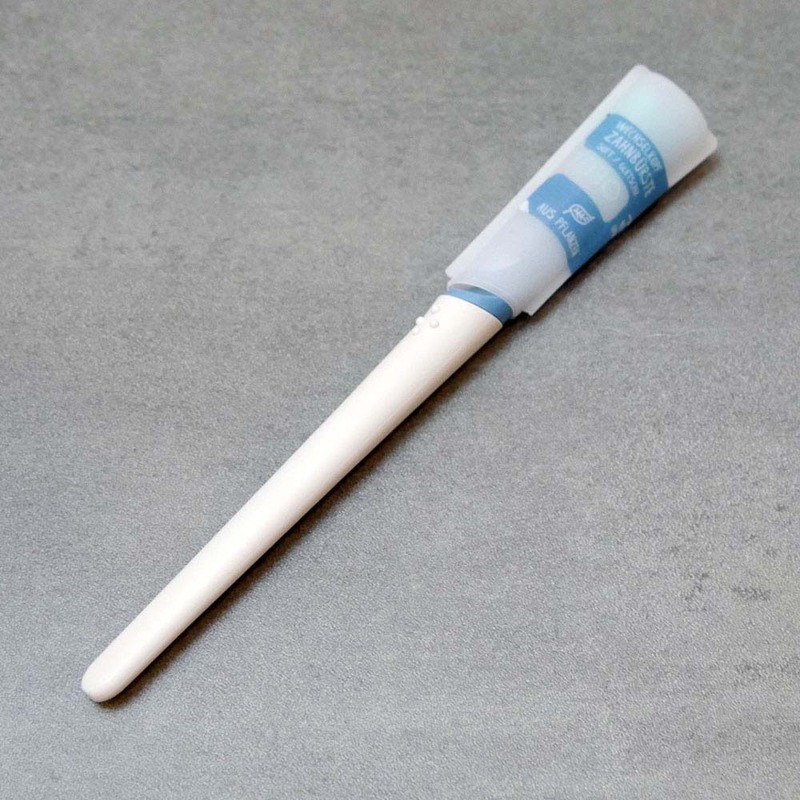 A possible downside is the plastic is quite tough and there is little to no flex in the handle to absorb excess pressure or force that might be used when brushing. Detachable and replaceable the brush head is, I found this very stiff and difficult to remove and not exactly easy. In some respects this is a good thing, in another, some would be put off by it. I like the fact you can choose between the brush head colours, it offers a degree of personalisation and helps differentiate if multiple people in a household are using the same brush. The included travel cap/case is a nice touch and does the job it needs to well. It simply clips around the head and clips such. Its a translucent colour plastic and fits onto the head only 1 way. There are no ventilation holes, so do remember to open or remove the cover as soon as is possible to allow the bristles to dry out properly. Whilst not all brushes have them, there are no fading indicator bristles on the brush head to show when the head is wearing out and may need replacing. Bioplastic – Is it really the answer? Before any conclusions can be drawn and ultimately sum up what I think about TIO and their brushes, I think it is essential to touch on the main USP of TIO, bioplastic. Bioplastic uses renewable resources as the basis for its construction rather than non-renewable. What this means is that essentially organic, plant based materials are used to create the toothbrush and brush head unlike other plastics that are made from petroleum based polymers. Whilst far from ‘complete’ my own research amongst friends and family of differing ages and backgrounds suggested that most believe bio is better for the planet and believed that bioplastics could be recycled or biodegraded quicker than more traditional plastics. The reality is that just because it is bio-based does not mean it is biodegradable. Essentially, the term bio is all too often associated with eco and the more environmentally considerate perception is given. Technically all plastics will eventually degrade at some point, the question is how quickly. The assumption most make, myself included, was that bioplastics degrade in a matter of months or years rather than decades or centuries. Some people believe you could even compost your bioplastics. Whilst bioplastics can be composted and break down quicker, the product needs to be made to this standard and processed accordingly when disposed of. What this means is that some products that are made from bio-based materials and can biodegrade quickly can and will do so, only when the right conditions exist. The sad reality is, few products are made to this standard and few systems exist to allow for this biodegrading to happen. Whilst for the most part bioplastics are more sustainable, without getting into lots of science and debate, the reality is that bioplastics are not as good for the planet as many perceive. Any greenhouse gas emissions that may have been spared in the production, can actually be undone depending on how the product is disposed of. In fact, when placed in landfill, because the plastics degrade without oxygen, methane gas is released, a greenhouse gas 23 times worse than carbon dioxide. Much of this stems from improper education and public awareness as well as inadequate systems to deal with and encourage the appropriate production and disposal of bioplastics. The intention behind bioplastics is great and with the right infrastructure it is better for the planet, but too much confusion and inefficient systems exist, meaning really at present, most, if not all of the benefits are lost and potentially the planet is at more harm. Even in the UK, where we have theoretically well established and robust kerbside recycling programmes and recycling centres, there are limited ways to properly dispose of brush heads in an environmentally responsible way. Concluding thoughts – Are they worth buying? 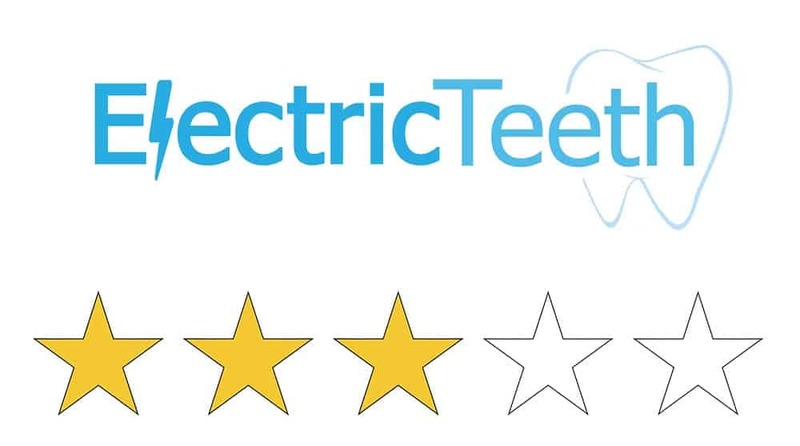 This review can be concluded in 2 ways, because I have reviewed here 2 products, the manual brush and the electric toothbrush heads. Considering the manual brush only, on the whole I have positive things to say about what it stands for, how it performs. There is a small premium to be paid, but I think this is worth it for what you get. When it comes to the Oral-B compatible heads, then on the whole they cleaned really well and are competitively (ish) priced. I like them, but I cannot recommend them until I see evidence that they are more reliable in their long term fit to the Oral-B brush handles. What perhaps takes away from what TIO are doing and offering is the global misunderstanding of bioplastics. Most people believe that bioplastic is a significant improvement for the world as a whole. Many people I have spoken to, presumed that it meant it degraded much quicker and could almost be thrown on your compost heap at home. Sadly this is not the reality. Don’t get me wrong, this is a fantastic step in the right direction, but few really understand that in reality the environmental benefits (currently) are not quite as great as one might first think. This is not a reflection on TIO as such, I applaud them for pushing the market in a more sustainable direction, but there needs to be better education, understanding and infrastructure from all involved. 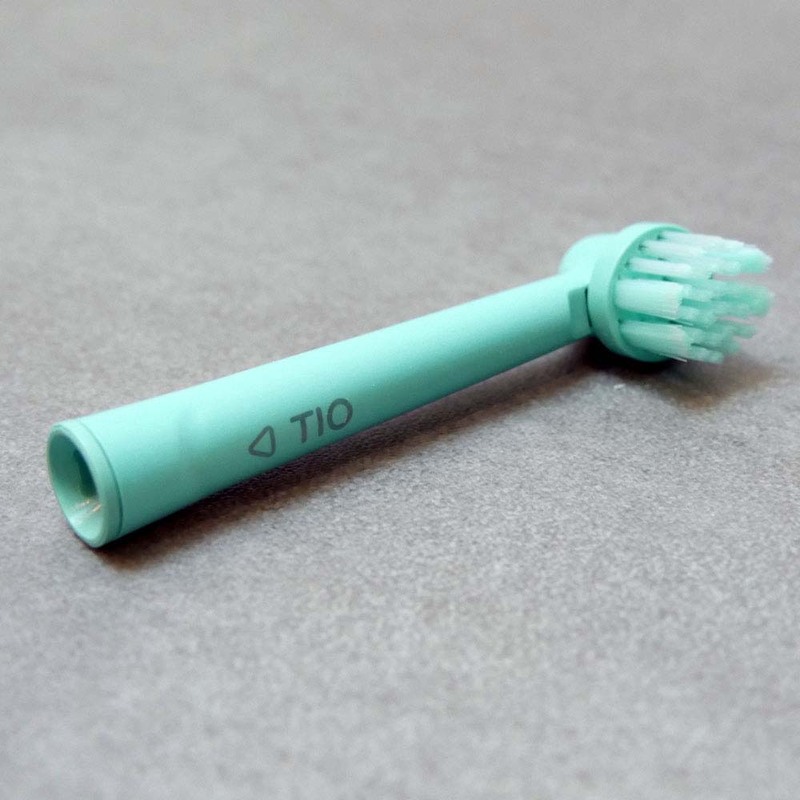 Do you use or have you used TIO brush heads or their manual toothbrush? How do you or have you found them? Please leave your thoughts, opinions and comments below, we would love to hear what you have to say.